Delta, BC ­- I​n three weeks, more than 200 professional cyclists from every corner of North America and around the world will converge on the Lower Mainland for BC Superweek, which begins with the $25,000 Tour de Delta. Bordered by water on three sides, the Corporation of Delta provides a spectacular backdrop for the MK Delta Criterium on Friday, July 10th in North Delta, the Brenco Criterium on Saturday, July 11th in Ladner, and the UCI sanctioned White Spot | Delta Road Race on Sunday, July 12th in Tsawwassen. Having a 1.2 UCI sanctioning for both men and women in the White Spot | Delta Road Race ensures that the level and depth of the field will include some of the best professional cyclists in the world. “The U​CI sanctioning allows countries to accumulate valuable points towards international rankings, which increases the number of athletes who can compete at World Championships and the Olympic Games. Racing on Canadian soil also allows more Canadian riders to participate. That, combined with home field advantage, allows us the opportunity to hopefully maximize the amount of points our riders can achieve,”​added Cycling Canada President John Tolkamp. For fans and aspiring cyclists watching the UCI sanctioned competition at the White Spot | Delta Road Race, the experience of seeing Canadian athletes up close and personal accumulating points with an eye on international competition should definitely leave an impression. 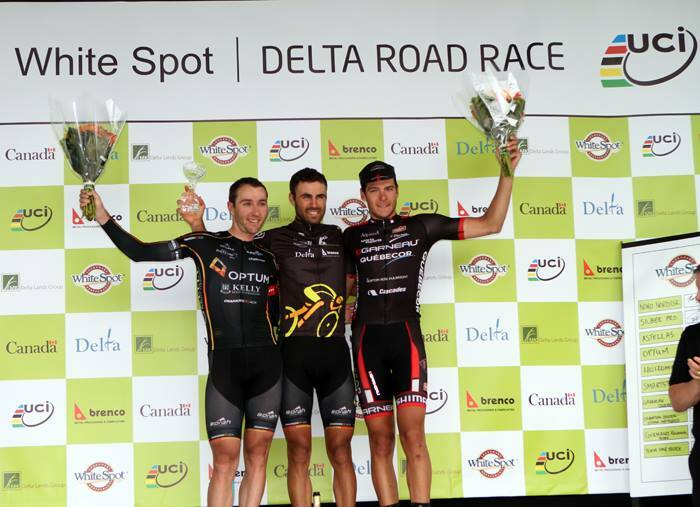 Meanwhile, organizers of the Tour de Delta will try to bring some of the fast paced excitement of a criterium to the White Spot | Delta Road Race with changes made to the course for 2015. The course now involves two loops totalling 13.15 kilometres and will see the riders pass the start/finish area every eight minutes instead of every 16 minutes. A large screen TV located at the Community Festival at the start/finish line means spectators there will be able to see where the riders are at throughout the race. “The alterations to the White Spot | Delta Road Race course this year will really see the race elevated by adding further excitement and entertainment for all spectators. These improvements along with the fact that the White Spot | Delta Road Race is an international event taking place in the Lower Mainland should bring a lot of enthusiasm for all the fans and the riders,” said Ernsting. BC Superweek is Canada’s biggest professional road cycling series and features more than $120,000 in prize money available during eight races over nine days. BC Superweek runs from July 10 – 18, and is made up of the Tour de Delta (July 10, 11, 12), UBC Grand Prix p/b Mahony & Sons (July 14), Global Relay Gastown Grand Prix (July 15), Giro di Burnaby p/b Appia Development (July 16) and Beverley by Cressey presents the Tour de White Rock (July 17, 18).